Green Town Tavern is that special place where all the locals hang out, but newcomers will always feel at home. 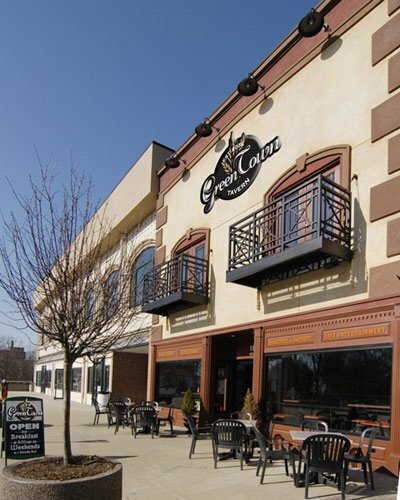 With a friendly staff and a menu full of comfort foods, your first time here will not be your last! Ray Bradbury, the celebrated American master of speculative fiction, has emotional ties with Waukegan that are as deep as the haunting ravines he described in one of his masterpieces, Dandelion Wine. Few authors of his distinguished accomplishment are so closely identified with the towns that shaped them as is Bradbury, who over a 60-plus-year career has demonstrated abiding love for his former burg by placing it at the center of some of his most renowned stories. Green Town was the pseudonym for Waukegan in a trilogy of Bradbury’s novels -- Dandelion Wine, Something Wicked This Way Comes and Farewell Summer -- as well as numerous short stories. In these tales, Green Town/Waukegan and its idyllic small town ambiance act as both the backdrop for flights of fantasy and as the stories’ central character. Bradbury has stated many times that Waukegan and its optimistic residents shaped his very being. These novels and many other works are an obvious doff of the hat to the place he holds dear. The admiration is mutual. Waukegan has made Bradbury part of its fabric by repeatedly honoring one of its favorite sons. His is one of five stars on its Walk of Fame. Ray Bradbury Park was christened in his honor. A short story festival has put his works on a literary pedestal. A garden project in the city’s downtown reflects the vibrancy of nature he discovered here as a boy. And now, Green Town Tavern, located in the bosom of Bradbury’s beloved city, offers another toast to Ray Bradbury. In Dandelion Wine, the author took great pains to stress the overriding lesson he learned while coming of age in Waukegan -- Despite the march of time and technology, there is no replacement for human interaction. It is in that spirit that Green Town Tavern opens its doors and welcomes all.